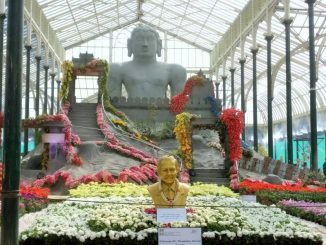 Thinking of heading to Lalbagh Park this weekend to check out the flower show? You’re not alone. Since the show began on Friday, locals and visitors alike are already flocking to witness the colourful array of flower and plant-based art. The show will be there every day from August 7 to August 16. It is the 202nd biannual festival, held once in the week of Republic Day and once in the week of Independence Day. This year’s show cost an estimated Rs. 1 crore and 20 lakh to put on. We paid the park a visit this Friday to bring you the need-to-know information before you embark. If you’re bringing your own vehicle, you can park the four-wheelers at Shanti Nagar BMTC parking area or at BBMP multi-parking area at J C Road. Two-wheelers can be parked at Al-Ameen College grounds. No private vehicles are allowed inside the park. Next, get your tickets. The ticketing booths are available in all the four gates of Lalbagh. Cost is Rs 50 for adults and Rs 10 for children on weekends. Cost for adults drops to Rs 40 during the week. Note that tickets are not sold at regular park hours, and instead are sold from 8:30 am. to 6 pm. A few yards away, security will mark your ticket and you’ll have full access to all of the exhibits. You can also book your tickets online here. A camera! There are over 800 exhibits in the Glass House, and plenty to see outside of it. Capture some of the blossoms before they disappear next week. Some extra cash if you want goodies from the shops. Outside the ticketing area there is a small flock of ice cream vendors. Inside, leading up to and around the Glass House, there are shops selling snacks, spices and tea, honey, pickles, bags and lots of greenery. If you’re inspired by the displays, there are plenty of opportunities to bring home some flowers and bamboo of your own. An umbrella or rain coat. Much of the show lacks shelter, and there aren’t a whole lot of places to hide if it starts raining. Drinking water and toilets are available inside the park. The Bengaluru Palace replica is made of 3 lakh white and red Dutch roses. Towering over the other exhibits at the centre of the Glass House, it stands 35 feet tall, 45 feet long and 22 feet wide. It is surrounded by flowers and plants of all types, and its front is guarded by statues of armed guards and fierce-looking wildcats. The sand sculpture of the late President, Dr APJ Abdul Kalam. The head of Kalam is carved in sand, flanked by a painted Indian flag. The exhibit is sheltered by a canopy, and should be available for viewing during the entire show. It is outside, on the pathway leading up to the Glass House. The Mysuru Maharajas. There are five of these statues in the Glass House, accompanied by plaques commemorating their accomplishments and surrounded by flowers. All five face the palace at the centre. The elephant made of Capsicum. While not a centrepiece to the show, the elephant stands taller than most visitors and is made entirely of red and yellow capsicum. You can find him inside a set of gates to your right as you enter the show. The flower bandstand. Just behind the Glass House, a bandstand stands in the centre of a series of musical flower sculptures, including a phonograph and horn. The horticultural tent. A straight shot from the ticketing gate, the tent is a sort of museum of modern horticulture, with information about the state’s food production and examples of some of the native foods, including pomegranates, bananas and pumpkins. Follow the trail behind the tent and you’ll see a large collection of vegetables and herbs being grown. Landscape gardening and terrace gardening to the North of Glasshouse. Photo gallery of Mysuru Maharaja family with some of the rarest photographs of erstwhile kingdom.